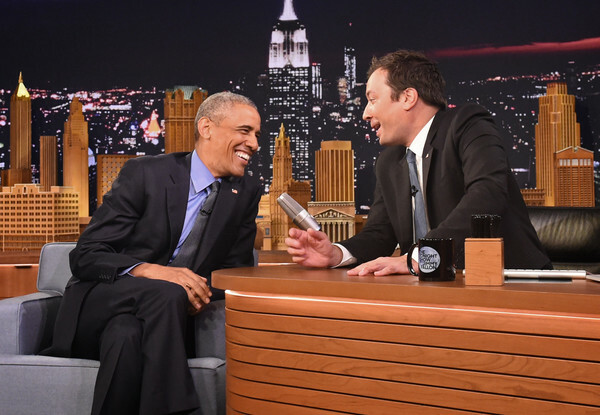 President Barack Obama speaks with Jimmy Fallon on the set of the “The Tonight Show Starring Jimmy Fallon” on June 8, 2016 in New York City. President Obama is the first sitting president to appear on the show. *During his first appearance on “The Tonight Show” under Jimmy Fallon, President Obama said he is actually “worried about the Republican Party” with the rise of Donald Trump as its presumptive nominee. Asked if he believed the Republicans were happy with their choice of Trump, Obama replied, “We are.” The audience laughed, according to a transcript released by NBC. The full interview airs on Thursday night. “So I am actually not enjoying, and I haven’t been enjoying over the last seven years, watching some of the things that have happened in the Republican Party ’cause there’s some good people in the Republican Party,” he said.